At the Mitchell Community Center, a group of children get handcuffed. The rest of the summer camp students in the room giggle. Students at Sexton Community Center learn about how to interact with police as part of Know Your Rights Theatre, a program of the Mid-South Peace and Justice Center. "Now, what went wrong this time?" asks LaJereka Hunt, who is dressed as a police officer. Her partner at the Mid-South Peace and Justice Center, Paul Garner, holds up a hand-lettered sign as a hint and the children repeat in unison, "I want to speak to an attorney or my parent." 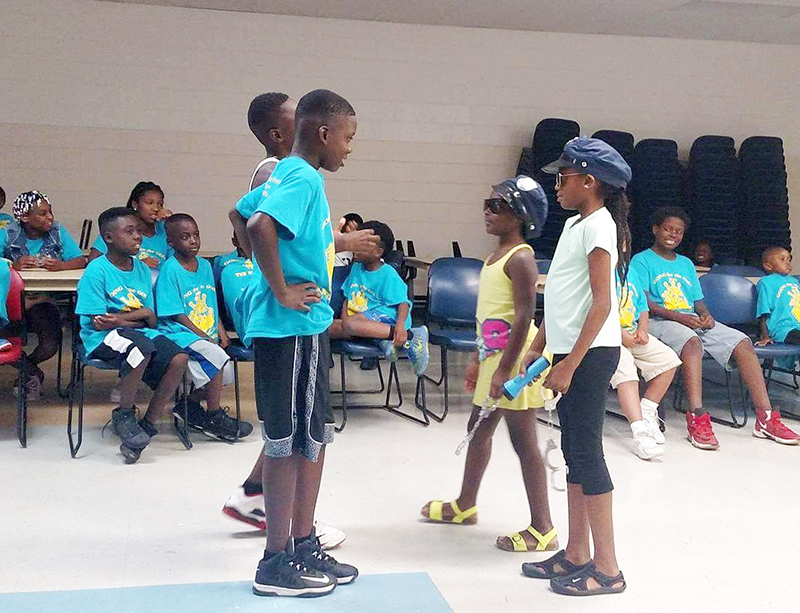 In between snack time and recess, students attending the Memphis Park Services’ summer camp program get a crash-course in how to interact with the police. Memphis United, a grassroots coalition housed at the MSPJC, has hosted 60 of these workshops, called Know Your Rights Theatre, over the past two months. More than 600 students have participated in the workshop’s inaugural season. In the group at Mitchell Community Center, the kids range in ages 4 to 12. Garner and Hunt guide a group of volunteers through a scenario where they're stopped by police for truancy and then handcuffed for a possible connection to fresh graffiti. If the kids remember to remain silent and consent to pat downs, but not backpack searches, they're free to go. The program can scale to meet the needs of high school students, but the message remains the same. Children aren't taught in schools how to interact fairly with police, Garner said. Their first introduction to law enforcement might be a warning lecture from their parents or a TV show. Know Your Rights Theatre demystifies the process and cuts through misinformation. "In every group we've worked with, we've had participants who have had interactions with law enforcement," Garner said. “We want them to know that even though they are kids, they have rights that should be respected and upheld." After the hour-long session, students are given a Know Your Rights handbook that outlines what the public’s rights are when a police officer stops them on the street, in a car, on campus or at home. The booklet also contains information about filing a complaint against a police officer, filming the police, and immigration-related arrests. The students are encouraged to bring home the booklets, which are printed in both Spanish and English, to discuss law enforcement with their families. The booklets actually provided the catalyst for the workshop. Garner developed and distributed them earlier in the year when the nonprofit Memphis United was campaigning for an overhaul of the city’s Civilian Law Enforcement Review Board. When Memphis United starting getting calls from community and school groups about coming in to lecture about the information, they decided to bring the content to life. In each workshop, students are encouraged to speak about their own experiences with the police and recent events in the news. Most of the workshop attendees are African-American children, a demographic making up 44 percent of all detained youth, according to the Center on Juvenile and Criminal Justice. The summer’s last Know Your Rights Theater workshop, held at Mitchell Community Center, came less than a month after thousands of Black Lives Matter supporters blocked the Hernando DeSoto Bridge. Hunt said the workshops provided a place for students to work through what happened on the bridge in Memphis as well as the recent police shooting deaths in Minneapolis and Baton Rouge, La., and the deaths of five Dallas police officers. At the recent workshop, several kids raised their hands to say they had family members at the bridge protest. Another girl asked why the police killed people. “We’ve had about five people ask that question,” Hunt said. She said that when dealing with difficult questions, she and Garner will visit with a student after the workshop and try to process what has been heard in the news. “I think the workshops are important because by teaching the young people the principles of how to approach and collaborate with an officer, it promotes a better solution and maybe the chaos can die down a little bit,” Hunt said. While the first season of Know Your Rights Theatre has wrapped, Garner hopes to bring the workshops into classrooms during the school year. Know Your Rights Theatre is the first piece in a juvenile justice project spearheaded by the MSPJC. Through the project, Memphis United is partnering with the Shelby County Juvenile Court to rework how juvenile offenders are assigned compulsory community service. Instead of assigning them to a work assignments by ZIP code, which can be far away from one’s actual community, Memphis United is advocating for a neighborhood-based approach. Community pillars, like churches and neighborhood organizations, would become partners in providing service opportunities. MSPJC would then work with local leaders in convening semi-regular meetings, moderated by youth from within the communities that address crime from a holistic approach.